In this article, David Mathis reminds us from Scripture of the certainty of false teaching arising within the church. He draws attention to what characterizes false teachers, and to notice the fruit of their teaching efforts, according to 2 Peter 2. In this sermon, “Always Learning, Never Arriving at the Truth” (2 Timothy 3:6-9), Kevin DeYoung addresses the topic of false teaching in the church. He asks the question: what is false teaching and how do we spot it? DeYoung offers 15 questions to ask that can help identify false teaching. He also wrote a summary article here. In this article, Christina Fox offers insight to helping our children develop discernment in their reading. She asks questions about the author’s worldview, the type of character traits the book highlights, whether it is good literature, and the value of reading together. You can read the full article here. Women Teaching Men: How Far is Too Far? Can women teach men the Bible? Should they preach on a Sunday morning from the pulpit? In a co-ed Sunday school class? A mixed small group setting? Is it ok if she is teaching “under the authority of the elders”? Mary Kassian does an exceptional job of taking on this controversial topic from a biblical perspective in this article, “Women Teaching Men – How Far is Too Far?” She offers much to think about and helpful questions to consider on this subject. Check out the full article here. How do we help kids navigate our media driven culture? In a day when everyone has a screen in their pocket, they are bombarded with messages from advertisements, internet clips, video games, TV, movies, and all types of social networking. As parents we must take care to develop discernment in these areas so that we can model and teach these skills to the next generation. The Southern Baptist Theological Seminary has an excellent blog with great articles on a wide range of topics from current events and book reviews, to discipleship in the home and church. I love the closing words of Paul’s first letter to the Thessalonians. He is so encouraging and filled with love as he gives them teaching and words of caution. In this section, Paul gives both the early church and believers today an exhortation to be discerning with teaching. Notice the context here is within the Church. Paul is reminding believers not to simply receive everything taught, assuming it to be consistent with the gospel. Rather he reminds us to test everything, to listen carefully, to think critically about what is being taught and practiced. We cannot assume everything with a “Christian” title is truly upholding God’s Word as revealed through Jesus Christ. This is why it is critical that we bring our Bibles to church, come prepared to worship, and to always be actively engaged as students of the truth. Once we have tested, we should determine what is good or evil, true or false, beneficial or detrimental. The Bible is what we use to test, as we know that in its entirety it is good, true, and beneficial. If you sing or hear teaching that seems unsettling in your church, online, or on TV, I encourage you to search the Scriptures. Go to your husband with your questions and an open Bible to help clarify your understanding. Together seek the wisdom of your pastor or elder on a concern, again with an open Bible in order to seek the truth together. Once we discern what is false we are to completely avoid things that are contrary to the Word of God. Let us remain diligent in our study of Scripture, that with prayer and the leading of the Holy Spirit, we may be equipped to test everything, hold fast what is good, and abstain from every form of evil. “We cannot assume a particular viewpoint is true just because everyone else thinks that way—or because it is what we have always believed, or because a well-known Christian author promotes that position, or because a well-meaning friend or counselor says it is right. Everything we believe and everything we do must be evaluated in the light of God’s Word. That is our only absolute authority” (Lies Women Believe and the Truth that Sets Them Free, p. 251). 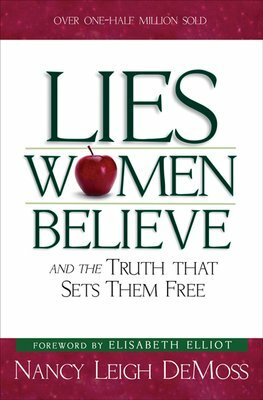 In her book, Lies Women Believe and the Truth that Sets Them Free, Nancy Leigh DeMoss identifies a number of areas in which women struggle to discern truth from error. She establishes the need to study and know the Bible so that we do not fall prey to common lies of the enemy in our own hearts, about our families, within our churches, and from the surrounding culture. DeMoss explores eight areas in which lies commonly occur: about God, ourselves, sin, priorities, marriage, children, emotions, and circumstances. She then discusses a variety of Scriptures that shed light and truth on each of these topics. If there is a particular area of weakness that resonates with you, this book is a great starting point to look further into what God`s Word has to say about the lies that can so easily entangle our hearts and minds. “All those who are saved must begin to progress in their ability to discern. Proverbs 9:10 tells us, “The fear of the LORD is the beginning of wisdom, and the knowledge of the Holy One is insight.” This word translated as “insight” is a Hebrew equivalent to “discernment.” Solomon tells us here that to know God is to possess discernment. Those who fear the Lord, those who know God, must be discerning, for God himself is the very sources of discernment. 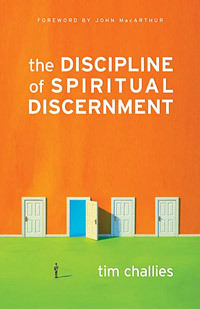 God is also our motive for discernment, for by living lives marked by discernment we bring honor and glory to his name” (The Discipline of Spiritual Discernment, p. 28). Tim Challies provides an excellent resource on the topic of discernment, defining it as “the skill of understanding and applying God’s Word with the purpose of separating truth from error and right from wrong” (p.61). He discusses the benefits of gaining and cost of ignoring discernment, as well as the challenges of this discipline in our culture. Following a thorough treatment of the topic, he also gives a full chapter to practical steps on how to practice and develop discernment, along with an appendix of helpful resources.